Search Results for "kids at preschool classroom"
Beautiful mixed race female teacher in eyeglasses working with cute diverse multi ethnic children in preschool classroom. Positive female teacher communicating with creative kids in kindergarten. Multi ethnic diverse preschool children drawing with colorful pencils in kindergarten classroom. Female asian teacher helping multicultural kids express their creativity and imagination at class. Positive multicultural preschool girls drawing with chalks at blackboard in kindergarten while teacher with kids learning in background. 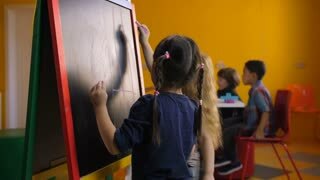 Cute diverse children writing on chalkboard at classroom. Beautiful female teacher reading fairy tale to attentive diverse preschool pupils in kindergarten. Rear view of multicultural kids sitting in a row on floor listening to teacher reading book in class. Creative multi ethnic boys drawing with chalk and felt-tip pen on easel board at preschool class with teacher and little girls learning at table. Diverse kids developing creativity in kindergarten. Portrait of happy positive preschool teacher with cheerful multi ethnic diverse pupils reading and discussing a book in kindergarten. Attractive daycare worker reading to a class of preschool kids. 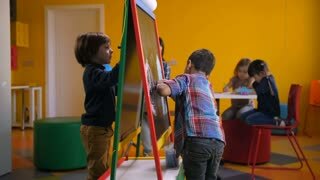 Rear view of engrossed little boys drawing with chalks at easel board with blurry preschool teacher with cute girls playing with colorful didactic toys at kindergarten. Children learning at classroom. 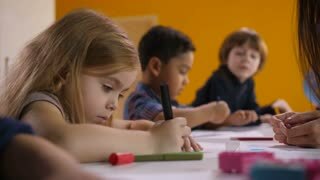 Positive attractive female asian teacher helping diverse preschool kids to draw at class in kindergarten. Smiling teacher and pupils working at the desk together during studying in preschool class. Diverse multinational preschool children with mixed race teacher enjoying playtime with colorful construction toy blocks in kindergarten clssroom. Engrossed kids playing with didactic toys at class. Cheerful female teacher and happy multinational children creating toys from constructing blocks in kindergarten. Lovely teacher helping diverse kids to express creativity and ideas with didactic toys. Beautiful preschool mixed race teacher with cute little girl playing with colorful plastic toys, putting toy blocks on fingers and having fun in kindergarten while kids busy with toys on background. Playful preschool multinational boys arguing over a toy in kindergarten. 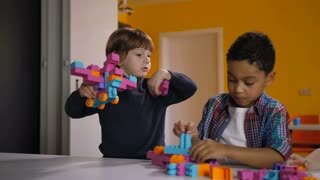 Joyful multi ethnic children having dispute about pieces of construction toy bricks during playtime in classroom. Cheerful lovely kindergarten teacher reading and discussing a book with multi ethnic diverse children in preschool class while sitting on the floor. Positive daycare worker with kids reading a book. Cheerful smiling multicultural little pupils with positive mixed race female teacher creating hand painting art in kindergarten. Craft drawing education developing creative abilities of children. 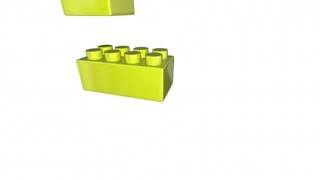 Side view portrait of cute little asian girl with pigtails playing with colorful toy blocks in preschool class while sitting on floor over kindergarten teacher and diverse kids playing in background. Portrait of beautiful teacher with multinational diverse kids playing with colorful didactic toys in kindergarten. Preschool multi ethnic children creating toys from constructing blocks in playroom. Cute little girl engrossed in drawing at art lesson in kindergarten with multicultural kids and teacher working in background. Multi ethnic diverse children developing creativity in preschool class. Female teacher with her multicultural pupils studying the world with the help of globe in kindergarten. 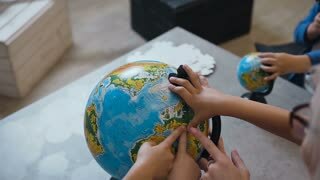 Preschool diverse children discovering the world, studying planet on globe in geography lesson. Positive mixed race daycare teacher and diverse multicultural kids learning and playing together in international kindergarten. Mulitnational pupils studying with didactic toys and book in classroom.